I’m becoming a father soon – what will happen to my productivity? Are you a productive person but also becoming a father soon? I have some important news for you: your work and personal productivity levels may decrease dramatically – at least temporarily! I realized this myself when my son was born *. Although I knew that my life is going to change for good, yet seeing this change in practice was much bigger than what I had thought. Couple of weeks after the birth, things started to settle a bit. In fact, I was able to adjust to this new life situation well and I knew that from now on we would have to live by the terms of our son. Let’s make this clear: Your daily schedule is going to change. Your spouse is going to be tied to your child and this is going to be a very intensive experience. Of course, it all depends how demanding child/children you have, but you have to be willing to let go of your own hobbies or other recreational activities (at least temporarily) and help your spouse to take care of your child. I understood this very quickly when my wife was feeding my son and I had to take care of different things like going to grocery store. On the other hand, I also started to help my wife by changing our son’s diapers, putting him to sleep, playing with him or bottle-feeding him. Just be aware that all of a sudden you may have lots of additional stuff on your daily task list. I have to admit that I was naïve of planning some schedules in advance. Little did I know that these schedules were not going to be valid, since my part was to assist my wife and take care of errands. 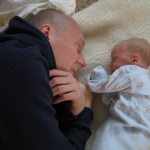 One thing that I felt gratitude towards was the paternity leave I had. In my country, we have a total of three weeks of paternity leave when a child is born (I took that in two parts, first two weeks right after the birth and then one week after the Christmas). That gave me flexibility to keep my productivity levels high. 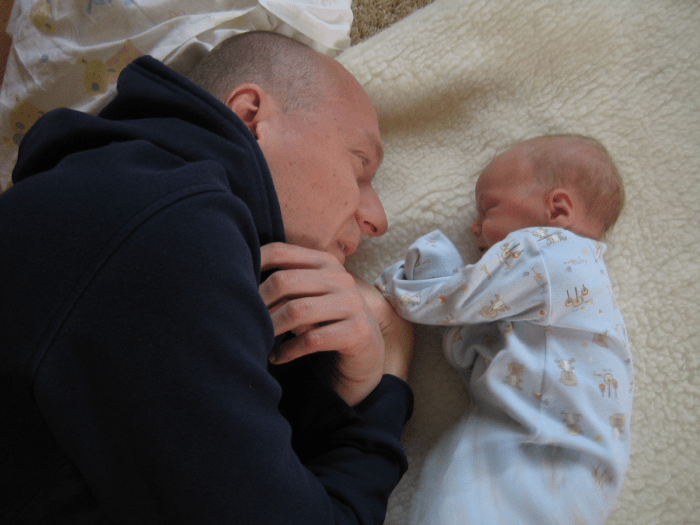 The paternity leave was also important for learning the new rules of the household: our son was (and still is) the center of our attention and his needs are priority #1 for us. I bet that without any leave, it would have been taken a longer time to adapt to this new situation. One thing that you will learn very soon is the rhythm your baby has. For us it was anything but regular. In fact, he didn’t sleep very much during the first two months and also, he was keeping us awake during the nights (and still is when writing this J). You should get comfortable with napping, if you haven’t done so already. After a couple of nights with just couple of hours of sleep, you need to refresh your mind by taking naps whenever it is possible. Also, I suggest of temporarily sleeping in different room if possible. This has enabled me to get at least some amount of sleep, before waking up early and going to work. Once your baby has a certain rhythm to follow, you will learn to take advantage of those moments by taking a nap yourself or working on your projects. There is also a certain moment when you could work on your personal projects: When your spouse is feeding your child. Of course, there are children who eat only from bottle, so in those cases you may need to help your spouse out by feeding your child too. But in other times (and if it’s OK by your spouse), you could spend that time working. This is what I have been doing and this setup has worked quite well. Finally, how you are going to take these changes is depends on your mindset towards the change. It is worth remembering that when you become a parent, it is silly to expect that things would go on as before. Becoming a father is the most profound and happiest moments I have ever experienced. Yet, if you are a productive person, you may feel that your own systems and routines are going to be tested hard when a baby is born. However, it is also worth understanding that time moves on very quickly. That’s why it is very important to live in the moment and have wonderful experiences when you child/children is/are small. 1. What was your strategy to stay productive? 2. Any tips for handling the new life situation becoming fathers are going to be experiencing? I would appreciate it if you share this post on Twitter, Facebook, Google Plus, LinkedIn or on BizSugar (click the vertical share bar on the left).